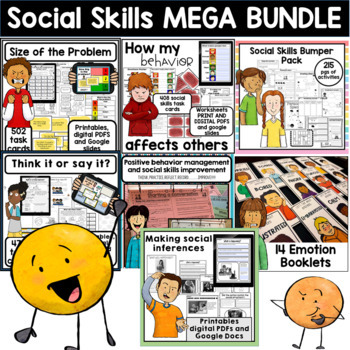 Included in this bundle are 7 of my best selling social, emotional and behavior skills and learning products. Think it or say it. 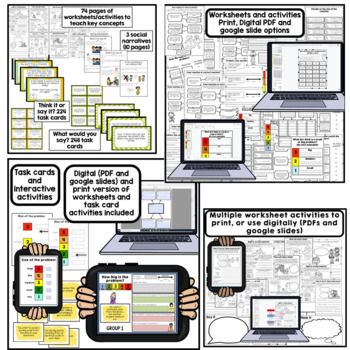 A variety of worksheets, social stories, activities and task cards that help teach students. 1) The difference between ‘say it thoughts’ and ‘think it thoughts’. 2) What others will think if you say a ‘think it thought’ or ‘say it thought’ out loud. 472- task cards These can be used for multiple interactive activities/games to further teach these concepts and enhance understanding. Reflection sheets for students to break down instances in which they have said ‘think it thoughts’ and for them to analyze what they could have said instead. This is a product designed to help students with autism and social skills deficits successfully differentiate between different levels of problems, as well as appropriately react in order to effectively problem. All too often I work with students whose reactions do not always match the size of the problem. Many times my students have over-reacted to a problem that is not a ‘big deal’ or that could have easily been solved by engaging in simple low level actions. This product allows students to think about problem sizes AND their reactions through a series of worksheets and activities as well as provide students with portable strategy cards that they can utilize in their social environments to be able to effectively problem solve and react appropriately.. 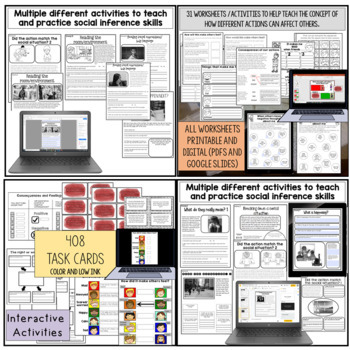 In conjunction with these activities, there is an interactive game utilizing task cards where students are able to practice what they have learned with their teacher or within a small group. Part 1- Use of worksheets and activities to teach the concept about how actions affect others, as well as identify the correct/incorrect way to handle a situation. Part 2- An interactive activity that involves 408 different scenario cards. Students read the cards and select how the action described in the scenarios would make other feel. This can be completed as a game with multiple students or as a 1:1 interactive teaching method. Students are encouraged to think about why the scenario would make others feel a certain emotion, social consequences experienced as a result of those feelings, and then different solutions if the action resulted in negative emotions/consequences. Part 3- Data tracking and behavior change goals- Once students are able to identify actions they engage in that may make others have negative thoughts, goals can be set and tracked (using student self monitoring data) to encourage more appropriate actions. This packet is designed to promote positive behavior change in students with Autism Spectrum Disorder as well as in students who experience daily struggles with social skills and problem behaviors. In order for students to be an active participant in behavior change and learn appropriate social skills, they need to be able to reflect on and self identify ‘what they did good’ ‘what went wrong’ and then ‘what they can do to have a better response next time’. They also need to be motivated to WANT to change. If you’re looking for ‘quick, simple’ and concise information on 14 key emotions to enhance social and emotional learning (alongside quick activities that students can ‘make, take and go’ to take home for personal reference), then look no further. For each of the 14 emotions included within this packet, information is provided on WHAT each emotion is alongside a variety of engaging activities to help your students ‘think’ about each emotion as well as relate the emotions to their own personal experiences. 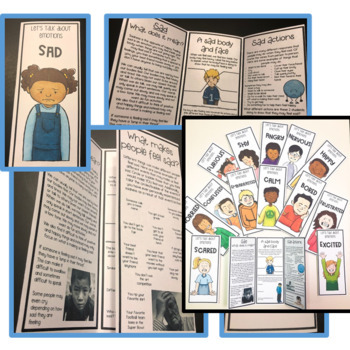 These tri-folds are perfect to help supplement social emotional learning activities/lessons and are an excellent learning tool that each student can keep, take home and frequently refer to when needed. Each booklet is available in both color AND black and white options. Students with Autism or other social skill deficits often struggle with inferring hidden messages and expectations presented in their everyday social environments. How are students expected to know that their friend is mad at them if their friend doesn’t tell them? How are students expected to know what voice level they should be using in the classroom unless the teacher tells them? Well they are able to find the answers to these questions by reading their friend’s body language and by reading the environment to see what voice level other students are using in the classroom (eg, if everyone is talking quietly, then we copy them and talk using the same level). However, students with Autism and other social skill deficits often have difficulty in reading these clues independently and can often engage in behaviors/say words that do not match the social situation (and at times are actions/words that may get them into trouble). This packet provides a wide range of different activities that allow students to practice inferring different aspects of the social environment including reading body language/facial expressions, predicting what may happen next given a person’s actions, reading the hidden message in someone’s words and reading immediate clues in the environment (and figuring out what you need to do given those clues). In this packet you will find a comprehensive set of activities to address a variety of key social skills. Students are introduced to each social skill through a variety of activities including social stories, worksheets and interactive board games. In addition, students get to practice each skill and receive reinforcement for correctly performing the skill in their social environments through behavior reflection/feedback and self monitoring. 215 pages of activities are included within this packet.